Ever thought about having a professional wedding guest...? We recently came across Emma Woodhouse, aka the Wedding Reporter, and thought this was such a lovely idea. Basically, Emma turns up with her notebook, soaks up the ambience and the details of the day, in order to go away and transcribe it all into a literary creative non-fiction account of your day. 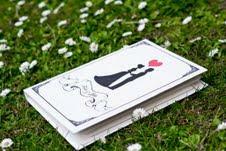 She then provides you with a wedding report which gives you an extra layer of texture to the memories of the day. She will write about things that you could have forgotten in the chaos that can be a wedding day. Then she can give you a published hard-back booklet which her designer can create for you, complete with bespoke cover. How great is that! This can also be a lovely present for those who can't make the day! Samples of Emma's writing and other wedding reports are available to read on her website theweddingreporter.co.uk as well as her rates.